A guide for tennis players. In recent times the ten point (super) tie-break has been introduced around the world in many Club and State tennis matches as well as tournaments to take the place of a 3rd set when the match is tied at 1 set all. The Super tie break has been designed to reduce the time on court for the longer matches. This format is gradually being adopted at the WTA and ATP tiournament level although some of these events will play the Super tie break at either 6 games each or 12 games all in the final set instead of replacing the deciding set. At 6 games all – in most competitions - the Super Tie-break game is played with numerical scoring instead of the usual scoring system. The player whose turn it is to serve does so for the first point in the tie-break from the right hand side (deuce court). The following servers then serve in turn for 2 points starting on the left (Ad court) side then the next on the right side until the end of the tie break game. The players change ends after every 6 points. A Ten point (Super) tie-break simply means that the first competitor(s) to win ten points with at least a two point advantage wins the game and more importantly the set. The game score for this set is thereby 7/6 although under many score recording systems the score is listed as 1-0 (x) with x being the number of points won by the losing player or team. .
All tennis players can improve their game by playing the best of 3 tie-break games with perhaps the first 2 played as 7 point tie breaks and the 3rd if applicable as a Super (10 point) tie break during regular training or squad sessions. 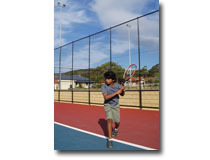 The pressure involved in these “mini matches” will help you adjust to playing tight matches in the future. Just a reminder that you need to practice Super (10 point) tie-breaks as well as the usual 7 point tie break to get the results. Winning the tie-breaks will give you a big advantage and put the pressure back on your opponent(s). Tennis the game of a lifetime.